Looking at this gorgeous cover, who wouldn't want to pick up The Program? After reading the synopsis, I just had to get my hands on it!! Simon and Schuster CA were kind enough to send a copy, so thank you again! Here, people aren't allowed to show any "sad" emotions whatsoever. If anyone shows sadness or slight depression, they are immediately "flagged" and put in a six week program called "The Program". In there, they are drowned with pills until they completely forget the sad memories and are completely brainwashed. Sound horrifying right? Exactly why Sloane and James know better than to express any emotions in public. Sloane and James and in love, and they are only able to express their true feelings in front of each other. When a tragic event happens with their best friend, James can't take it anymore. Sloane starts worrying for him, and tries to encourage him to look happy, but it just doesn't work. James gets flagged. 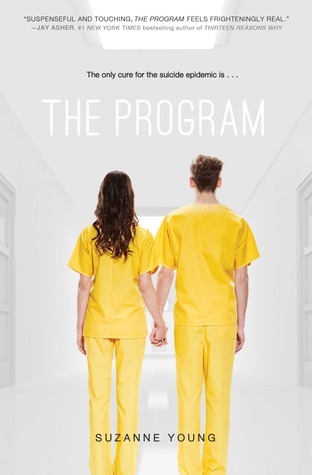 Before anyone says I'm spoiling anything, it's pretty obvious from the cover that BOTH of them are going to get into The Program, so don't worry. Let me tell you, Sloane and James were amazing characters. They weren't like any cliche young couple, but their love really stood out for me, and felt real. I immediately loved both characters. Something about Suzanne Young's writing just makes you want to never stop reading, and that's exactly what happened to me. The plot never gets boring, and every chapter is literally full of pleasant surprises. I honestly don't know how to say anything without ruining the book for you guys, but some very unexpected things happen. What I loved most was that the characters felt whole. Suzanne Young was able to portray the character as a whole, and was able to show us all sides of her characters. It was interesting to see Sloane in her highest and lowest moments, and that just made me connect to her more. Every dystopian book needs great world building, and I'm glad to say that The Program did not disappoint! It totally felt like I was living in this suppressive society where I basically couldn't breathe. There were some points where I really felt chocked up and sometimes depressed. Bravo for Ms.Young for that. Am I excited to get my hands in the next book? YES! Like all dystopian books, this definitely ends in sort of a resistance group forming or etc, and I AM EXCITED! I just can't say how much I loved this book, because it was great. If any book stirs up so much emotion from me, it will immediately be in my favorites list. Fans of dystopians will enjoy this one very much. Great review Farah! I completely agree with what you said about Sloane and James not having a cliched relationship. And how awesome is it that they were already together before the book started? We don't get that very often so I was really happy to see a couple who was already together. I loved this book too and I can't wait to see what happens next! Nice. I've been curious to see if others like this book. Its definitely staying on my wish list. Thanks for a great review. I really like it when characters aren't cliche and the feelings between them are believable. This sounds like a great book. Nice review, I agree. I thought Sloane and James were fantastic as well. My only reservation/issue was the epilogue, I think I understand it but then kind of got confused too. Though that did not detract from the overall awesome of the book! I've been seeing some amazing things about this book and really want to check it out :) Great review! For some reason, I wasn't so sure about this one, but you're review's got me excited to read it, so I might be picking it up! Great review! I LOVED this one! You're right...the characters were just so completely complete. Made the fantastic storyline even better. I am *dying* for the sequel already! This book is the first ever book I featured in WoW back in January and I am honestly so sad that I haven't read it still. I'm waiting for the paperback because I can't afford the hardcover. Glad you loved it Farah and this just made me pine for it all the more! I've read nothing but great things about this one! Can't wait to get to it which will sadly probably be months. Sloane and James sound like a great couple and it's nice to find a great romance that really stands out.